Holy Father, we are afraid that relativism - which you combat elsewhere - will be encouraged by your presence amid representatives of all the religions of the world. We are afraid that the Catholics who today are suffering persecution for their faith in Jesus Christ in Pakistan, Iraq, North Korea, China… might find that their tormentors are comforted by the public recognition and the media spotlight that Catholicism will provide for them by organizing this new inter-religious encounter. 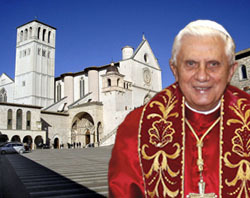 During the first inter-religious meeting in Assisi in 1986, in an attempt to reassure those who rightly objected that such an assembly of all religions could only increase confusion and encourage syncretism, the organizers resorted to this ridiculous quibble: they were not praying together, they were together to pray. In other words, it was out of the question for believers in Jesus Christ, Allah, Buddha, Shiva… to pray together; but if they were together, it was to pray separately! Next October we will not pray together in Assisi. We will be with the victims in Iraq, in Pakistan, praying with them and for them.